**ALBANY – #bFair2DirectCare today unveiled a 5,000-sq-foot billboard over Times Square that urges Gov. Andrew Cuomo to fund a living wage for direct care workers who support New Yorkers with developmental disabilities. The Governor failed to include living wage funding in his $176 billion budget proposal, even though it would amount to 0.05% of the total. "Direct care workers are on the front lines and do this job so state government doesn’t have to. Governor Cuomo should recognize this in his budget and include funds so they can be paid a living wage,” the #bFair2DirectCare Coalition said, noting that direct care workers are 73 percent women and 55 percent black or Latino. Direct care workers support persons with autism, Down syndrome, cerebral palsy and other developmental disabilities. Non-profits took over primary responsibility for this work, at the state’s behest, after the Willowbrook scandal of the 1970s, where residents were living in inhumane conditions in a state facility. “We appreciate the Governor joining with the Legislature two years ago to start funding a living wage for direct care workers, but since then he hasn’t said a word about them and hasn’t included funding to reach a living wage in his new budget,” #bFair2DirectCare said. Direct support professionals are highly trained in a wide variety of critical areas that include administering medications, giving first aid and CPR, behavioral interventions, supporting independent living and ensuring the safety and opportunity of those they support. New data show #bFair2DirectCare non-profits continue to face a debilitating staffing crisis due to low wages. In 2018, these non-profits had a vacancy rate of 14.3 percent and a turnover rate of 26.4 percent for direct support staff. The inability to attract and keep staff forced the non-profits to pay an astounding 12 million overtime hours in 2018 – up 17 percent from last year and adding $88 million in cost to the agencies’ already strained budgets. In 2017, Governor Cuomo and the Legislature included the first two years of a six-year plan to provide a living wage for direct care workers. However, funding has not been committed for the rest of the plan, leaving these non-profits in a perpetual staffing crisis and DSPs struggling to make ends meet. When fully implemented, the living wage for a DSP would be roughly $15.50/hour upstate and roughly $17.80/hour in New York City. The #bFair2DirectCare billboard, which features self-advocate Tony Phillips of New York City, will run for an undetermined length of time. It is located right across from the TKTS booth (on the southeast corner of 7th Avenue and 47th Street) and was made possible through a donation from a New Yorker active in supporting people who have developmental disabilities. #bFair2DirectCare gives voice to the more than 130,000 New Yorkers with developmental and other disabilities, their families, and who often cannot speak for themselves. 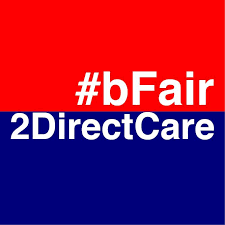 #bFair2DirectCare is also the call to action to remind state leaders that direct care non-profit agency workers are agents of the state who need a living wage that is commensurate with their vital support responsibilities. “Education is the great engine of personal development."